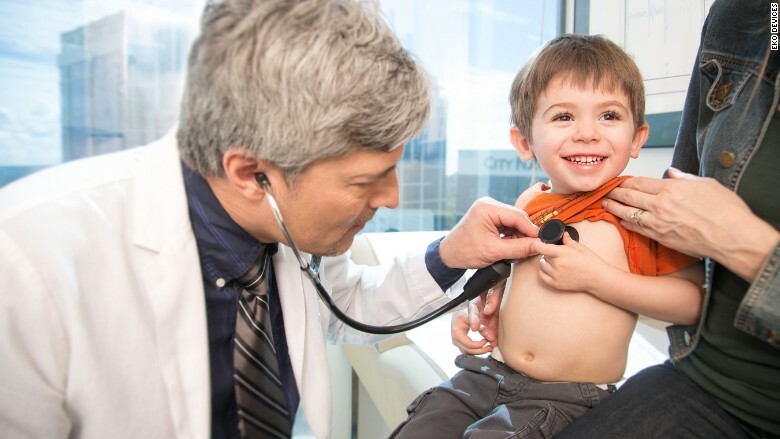 Good news: More doctors could soon be using "smart" stethoscopes on patients. Eko Devices, a smart medical device startup, announced on Wednesday that its Eko Core product has been cleared by the FDA. That means doctors around the country can use the technology on patients. Part of CNNMoney's Upstart 30, the company developed a device that turns "normal" stethoscopes into intelligent ones. By inserting the Eko Core into the tubing of a traditional device, doctors can take digital recordings of patient heartbeats using Bluetooth technology. The recordings are wirelessly transmitted to Eko's HIPAA-compliant smartphone app and web portal. Using the $199 device, which goes on sale Wednesday, doctors can chart the heartbeat or send the recording to a specialist for further review. That means patients won't have to wait to see a specialist for the results. Eko will also be selling a smart stethoscope for doctors who prefer to abandon their analog devices entirely, which will go for $299. "It's the first time the oldest and newest tools in medical toolkit are being married," said 23-year-old Jason Bellet, cofounder of Eko Devices. "We can track [heartbeats] over time -- from childhood to adulthood." Bellet acknowledges that it's not the first smart stethoscope out there, but Eko is the first to connect to a smartphone and wirelessly transfer a heart recording. While much of the medical field has gone digital, it's been a slow transition for the nearly 200-year-old stethoscope. "It has been stuck in the analog world," said Mayo Clinic's Dr. Charanjit S. Rihal. "With heart sounds, even if you're good at examining patients ... then what? It's in our heads, we make diagrams, but a year later, do [doctors] really remember what you heard? The answer is they cannot." Eko, which has received $2.8 million in funding, is only just beginning its cardiovascular innovations. "The real value is if engineers can figure out ways to analyze the sounds using algorithms," said Rihal, who joined Eko as an adviser. And that's exactly what Eko is looking to do. It is conducting trials in two San Francisco hospitals to pool heartbeat data from 200 kids and 200 adults. This data will be analyzed and tested to help develop a Shazam-like heartbeat functionality that Eko is building. It will undergo separate FDA-testing, which is slated for early 2016.